This picture is from Kenn Hadnot, a 2005 member of the Mandarins. 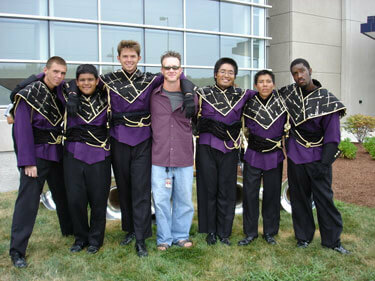 I am a contra player in the Sacramento Mandarins, and this picture is of the contra section with our instructor Nathan Brown at the 2005 DCI World Championship Semifinals. From left to right: Mike Hughes, Erik McCrossen, Taylor Schreiter, Nathan Brown (instructor), Ed Seguinte, Nicanor Rocha and me, Kenn Hadnot. My face looks really weird in the picture, but I was just happy we made it to the semifinals and sad that the season was over. So, I guess my face is a mixture of both feelings. For my rookie year in a drum corps, I think it went pretty well.